Just about everyone, from small children to grown men, avoid getting anywhere near a bee hive that hangs from the eave of the house or from a tree in the backyard, but 98 percent of the 20,000 known species of bees in the world do not live in hives, according to the University of Minnesota. These bees make their nests in holes in the ground or boring holes in wood and live either alone or in colonies, depending upon the species. You can recognize bumble bees (Bombus sp.) by their plump bodies, covered in yellow, orange and black hair. They usually mind their own business as they gather pollen and nectar from the flowers in your garden, storing it in pollen baskets located on their hind legs. Bumble bees form their bee colonies in underground holes and burrows abandoned by mice, chipmunks, moles and other rodents. You can also find them nesting under sheds and garages, as well as in trash piles of old cushions or mattresses. From a couple hundred to 2,000 bumble bees can live in one colony. Only female bumble bees sting if you get too close to the nest. 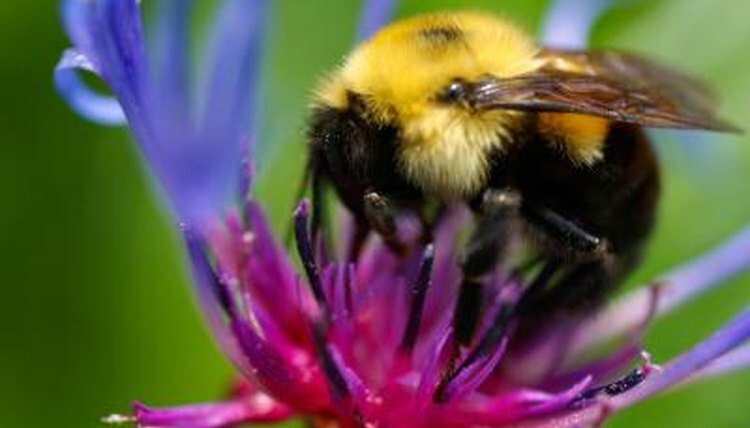 Most of the world’s bumble bees live in the Northern Hemisphere. The biggest solitary bees are carpenter bees (Xylocopa virginica), native to North America. These black and yellow bees look like bumble bees but do not have yellow or orange hairs but shiny, hairless abdomens. Female carpenter bees cause damage to homes, decking, wooden swing sets and windows, boring holes 1/2 inch in diameter, then tunneling to the right for up to 8 inches. She then forms individual cells for her eggs along the tunnel, leaving a ball of pollen for the larvae to eat. The male bees will fly near you if you get too close to the nest, but cannot sting. Females do sting if threatened. Miner bees (Andrena) are solitary, medium-sized, black ground bees with tan or reddish hairs. Native to the eastern United States, they search for sunny, bare spots to start digging a long passageway underground for nesting. Some females prefer solitary nests, away from other bees, while some miners cooperate in digging a main tunnel with offshoots for individual nests. The ground bees make the tunnel a bit wider than their bodies and about 1 foot long with an angled turn at the end for the nest, known as a brood cell. Here, the female bee gathers enough pollen and nectar for her egg to hatch and grow to adulthood. After laying her egg, the female miner bee seals the nest. She may dig other brood cells off the main tunnel, leaving an egg in each one. Leafcutter bees (Megachile spp.) are large, solitary, black and white bees that tunnel into rotten wood or thick plant stems, like roses. Leafcutters cut round pieces off the edges of leaves, using them to build nest cells for their eggs. These bees do not damage homes because they prefer soft, decayed wood. Leafcutters are native to western United States and only sting if handled. Native to almost all of North America, orchard mason bees (Osmia lignaria) work hard at pollinating all types of fruit trees. They are small, dark blue, docile bees that only sting if handled. Orchard mason bees do not bore holes in wood, but live in ready-made crevices and holes, such as nail holes, loose shingles or behind shutters.